NOTE: This content is old - Published: Wednesday, Nov 29th, 2017. There’s a big change taking place at the front of Wrexham’s new multi-million pound arts and market facility this week. 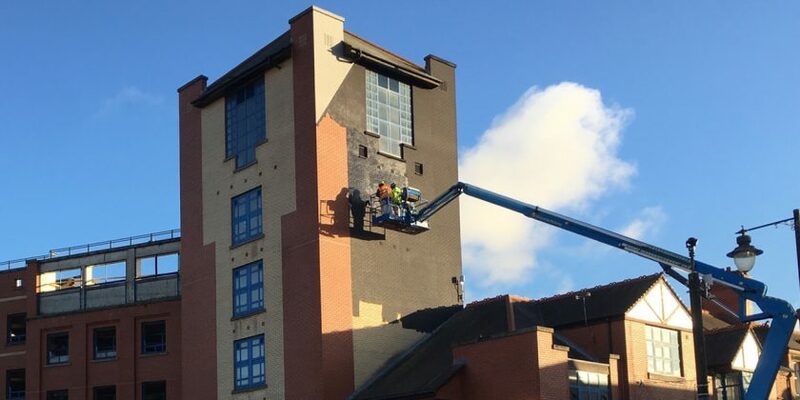 With just over four months until Tŷ Pawb opens, paintwork has started on the main tower of the building – certainly not a job for people who don’t have a head for heights! 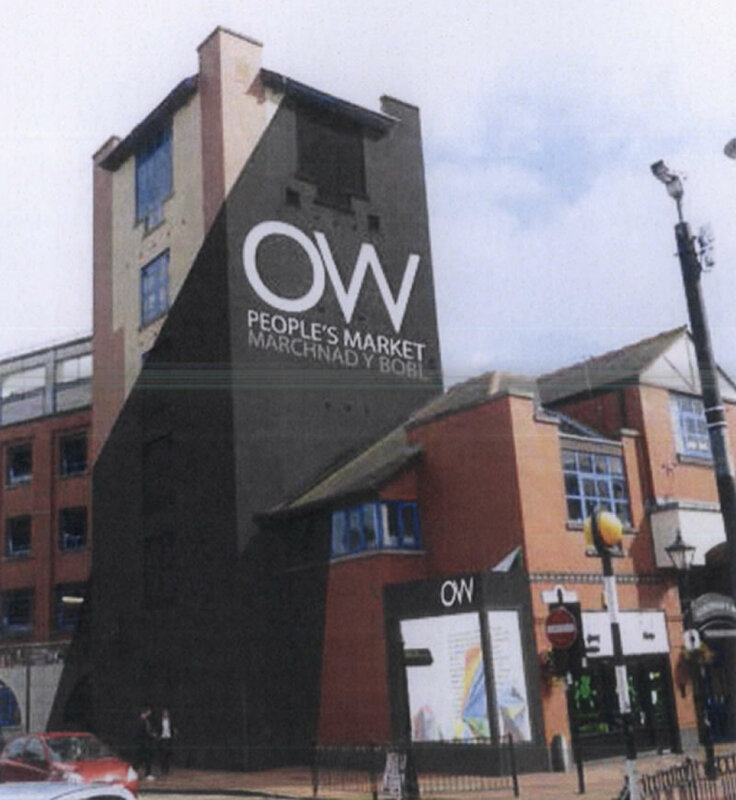 The black paintwork on the tower is one of the main changes being made to the exterior of the former Peoples Market, with the colour scheme and design featuring as part of a mock up released in 2015. Whilst the works are ongoing there will be scaffolding around the tower which will mean pedestrians using the corner will be re-directed through the fire exit and into the North Arcade of the former People’s Market. 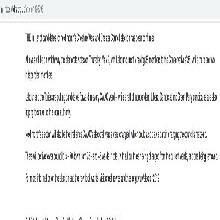 Wrexham Council say disruption to pedestrians will be minimal. Motorists will also not be able to turn onto the pedestrianised part of Chester Street whilst the works are taking place between 11am and 6pm Monday 27 November to Friday 1 December. An alternative route for motorists affected by the works is via Chester Street, Yorke Street, Mount Street, Salop Road, Eagles Meadlow Link Road, Smithfield Road, St George’s Crescent, Market Street and Holt Street. Signposts will be in place. 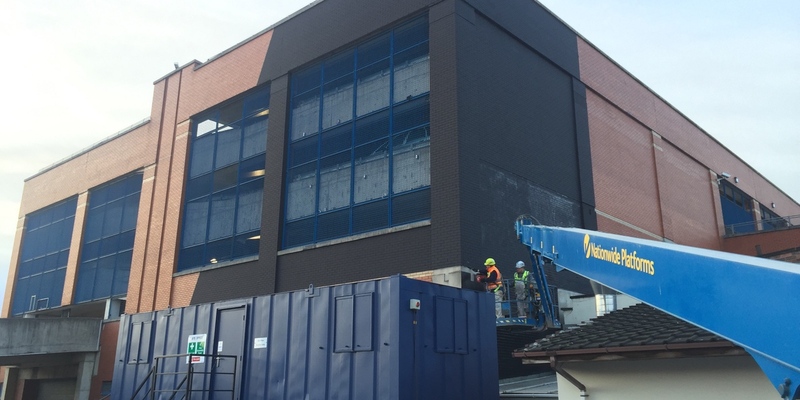 Earlier this month Wrexham.com reported that paintwork had begun at the rear of the property – the first of the major exterior changes made to the site. A combined total of £4.5 million – £2.3 million from Arts Council Wales, £1.5 million from Wrexham Council and £700,000 funding has been made available from the Welsh Government’s Vibrant and Viable Places Programme – has been spent redeveloping the former Peoples Market, with the project set to be complete by April 2017. There are just over four months left until the grand opening of the facility, with an official launch event for the grand opening scheduled for April 2nd 2018.